"Leslie! Get to bed!" called her mother from behind her bedroom door. "Okay," said Leslie, taking one last look out her window at the glittering landscape of Neopia Central, before turning off her light. 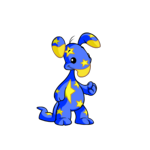 "I'm a starry Blumaroo," she thought to herself. "It's practically my destiny to become a star. But as of right now, it looks like I'll never get off Roo Island to get my big break in Neovision." The next morning, she waited in line for the Merry Go Round, one of the only things she found slightly interesting on the island. As she handed 50 NP to the Blumaroo running the ride, he happily shouted to her, "Congratulations, young lady, as the 500th customer today, you've won an all-expenses-paid trip to Neopia Central, where you'll star in a Neovision Visionaries Inc. production!" She looked around, shocked that she hadn't realized that there was a much longer line of customers than usual, and posters all around her proclaiming a promotional surprise trip to the 500th customer each day of this week. "Here's a form to fill out, just describing you a little, and the pass you need to show you've won. Would you still like to go for a ride?" the Blumaroo asked with a good-natured smile. "Why not," she said, getting on and taking in the scenery of the place she'd always longed to escape. Leslie got off the boat to the sights and sounds of Neopia Central, and hurried to the Neolodge, where she checked in and left her luggage. The next stop, according to the packet with her schedule on it, was the Neovision Studio, where she was going to be briefed on her part. She doubted she was allowed to be fashionably late, so she went directly to the large brick building. The sign had smiling neopets she'd seen in many episodes of her favorite Neovision programs, and said, "Welcome to Neovision Studio!" Going through the double doors and following arrows marked out for the contest winners, she managed to get through what seemed like an endless maze of hallways. Reaching a door marked "Meeting Room," she cautiously stepped inside, to find several neopets in casual business attire and a few pets dressed normally that, she assumed, were the other winners. "Ah, there you are, Miss... Leslie," said a Grundo, reading from a sheet of paper inside a folder. "Please take a seat. We were just about to begin." Hastily sitting down, Leslie watched the folder change hands, now in the claws of an Eyrie. She began to read off the segments of Neovision each of the winners would be featured in. "We received a little information about you, and we created our selections from this basic knowledge," she said at first, and after reading aloud Leslie's name, she continued to say, "Leslie, you'll be doing a one minute commercial for Starberry Farms." "A... commercial?" Leslie asked, not sure how to react. She was sure, for some reason, that she would be in one of the major productions, not a one minute blurb about starberries. She felt it was somewhat cliché, but then again, her idea of being a starry pet destined to be a star was somewhat cliché as well. So with a sigh, she took her script from a Kyrii who was passing out everyone's lines. "Now that you've been acquainted with the studio and your parts, you're free to have some of the buffet, catered by Kelp Restaurant, and spend the rest of the day sightseeing." Looking over to where the Grundo was pointing, Leslie was surprised to see a bizarre combination of an aquarium and a buffet, each dish in its own tank of water to keep it fresh. Getting a plate of Angel Hair Salad, she took a bite, now seeing why all of the celebrities raved about it. She had her fill of food, and then explored Neopia Central, starting to feel that her dreams were coming true, despite the minor setback of her first job. Heading towards the main shops, she thought that she'd never have to, or want to, leave Neopia Central. "Alright, Take One, Starberry Farms Advertisement," cried a Kougra with a clapboard. "Starberry Farms provides quality starberries and starberry products at quality prices. Um... er..." Leslie trailed off, so nervous she forgot her next lines. "Cut!" shouted the Kougra, then, lowering his voice, he said to Leslie, "Would you like to look at your lines again before we shoot Take Two?" "Yes, thank you sir," Leslie said, upset that she'd messed up her lines. She read it to herself three times over without looking at her script. "Okay, I think I'm ready." "Take Two! Starberry Farms Advertisement!" "Starberry Farms provides quality starberries and starberry products at quality prices. Shipped all over Neopia, the starberry is one of the most delectable treats..." Leslie put a paw to her head. "Um, I need one more second to think." "Cut!" the Kougra repeated. Leslie looked around the studio. Behind her, a green screen was showing pictures of Starberry Farm and all of the starberry products. 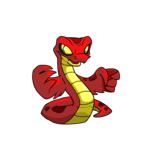 Neopets bustled around, changing camera angles, moving in and out of the room with stacks of paper in their arms. She felt like she was letting everyone down by not remembering, and she figured that was what was making her forget. "Leslie, you can do this. Just one minute, one more take, and I know you can get it right," she told herself. "I'm sure I can do it this time!" she called, and the Kougra responded with by clapping the clapboard for another take. "Starberry Farms provides quality starberries and starberry products at quality prices. Shipped all over Neopia, the starberry is one of the most delectable berries that can be served in such a variety of ways. If you haven't tried one, come down to Starberry Farms to taste test some of the brand new treats in the works!" "And that's a wrap!" exclaimed the Kougra with a smile, Leslie's own face full of relief. He came over and shook her hand. "It was a pleasure working with you. I think you've got some real talent!" "Really? Do you know anyone who could get me into another Neovision production?" Leslie asked hesitantly. "Sure, here's the address of a casting agency." He handed her a business card that said, "Mike Mynci, Neovision Visionaries, Director of Casting," along with an address in Neopia Central. "Audition for Mr. Mynci, and there's a chance you'll end up in a bigger production." "So... I have a chance to be a star?" she asked, barely keeping herself from bouncing up and down with excitement. "Yes, I think so!" said the Kougra. "Good luck out there, Leslie." "Thanks, sir," said Leslie, walking out into the light of a sunny day, thinking that even if it was dark and gloomy outside, her mood couldn't be ruined. The next day there was rain, thunder, and lightning, and a surprising realization. Leslie looked at her schedule to find that her return home was that day. Looking at the card for the hours Mike Mynci's Casting Agency would be open, she saw that the only way she could make it there in time was if she sprinted there the second she read it. So she ran, thinking only about how her career depended upon this opportunity. Arriving soaked with rain and tired from running, she entered the lobby to the agency. A bored looking rainbow Blumaroo looked up at her from the desk. "Hi," Leslie said, "I need to see Mr. Mynci as soon as possible, please." The Blumaroo closed her magazine, and the cover revealed a shot of Roo Island. With a wistful sigh, she said, "Do you have an appointment?" "No, but... what are you looking at?" "My family back home sent me this magazine. What's New on Roo, have you heard of it?" "Yeah, I used to read that all the time back on Roo Island," Leslie said, thinking back and feeling a pang of homesickness. "I moved here a couple of months ago. I'm going back, though. I miss it there." "I came here to be a Neovision star... I was painted starry, so it seemed right," Leslie said, not knowing why she included that detail. "It’s the same kind of story with me. See, I was painted rainbow, so I just thought it was meant to be that I go to the Rainbow Pool and work as a painter." "It's not as easy as you think to get a job in Neopia Central. Like with Neovision, for example, you probably are talented. I see maybe a hundred pets come through these doors every day, just for a five minute interview with Mr. Mynci. Sometimes that's the only time I ever see them, and I watch Neovision." "Well... still," Leslie said, deciding to take the opportunity to audition while she could, "do you have any openings for me to audition?" "Right now he's on his lunch break; maybe he'll see you," said the Blumaroo, preparing a neomail out loud. "Mr. Mynci? Would you be willing to see a client? Alright then, thank you," she said to his reply, and then, turning to Leslie, said, "He'll see you! Go down the hall and to the left. Good luck!" Inside the office, a Mynci was eating some type of Kreludan delicacy. At least it looked expensive. "...Hello? Mr. Mynci?" Leslie said, opening the door to the room. "There you are," said the Mynci. "Here's a script. Start reading and I'll tell you if you fit for any of the current acting roles available." Clearing her throat, she began, "Roo Island. A spacious, peaceful paradise with a friendly community and a beautiful landscape. Blumaroos are the main inhabitants of the island, and it is said that all Blumaroos call this place home, whether they live there or not. Most of the neopets that visit come, enjoy the fun and games, and return to their daily lives, but something draws Blumaroos to Roo Island. Is it the Merry Go Round? Is it the games? It seems to be even more than that--" Here, Leslie's vision became too watery with tears to read further. She looked up at the Mynci, a small half happy, half sad, smile on her face. "Ah, I see," said the Mynci, "When travelers from other areas come to Neopia Central with big dreams, I check to see if they're not just starry-eyed with the idea of Neovision fame and fortune. I give them a description of their home, and it's usually then that they realize that they're homesick." "How come you decided to do this?" "It's been my job to prevent actors and actresses from getting into the business and then leaving from homesickness, because once a neopet is under contract, it's difficult to leave and return home," Mr. Mynci said, getting up and shaking her hand. "Thanks," Leslie said, "I really appreciate it." When she got back to the lobby, the rainbow Blumaroo asked how her meeting had gone. "Really well. I'm going home," said Leslie happily. "Mr. Mynci helped me to realize where I know I belong. Roo Island! It was nice to meet you!" "Nice to meet you, too. But don't think this is the last time we'll see each other!" said the Blumaroo. "Why? I don't think I'm coming back here for a while," Leslie said, puzzled. "No, but I'll probably be back at Roo Island in a few days!" A few days later, Leslie was just about to go on the Merry Go Round. The Blumaroo running the ride recognized her. "Why, hello! How was your trip?" "It was fun, but I'm happy to be home," Leslie said. Those words couldn't be truer.